fish/ TROPICAL FISH/Ghost cat fish. Kryptopterus vitreolus, are also known as the glass catfish and alternatively also as the ghost catfish or phantom catfish. 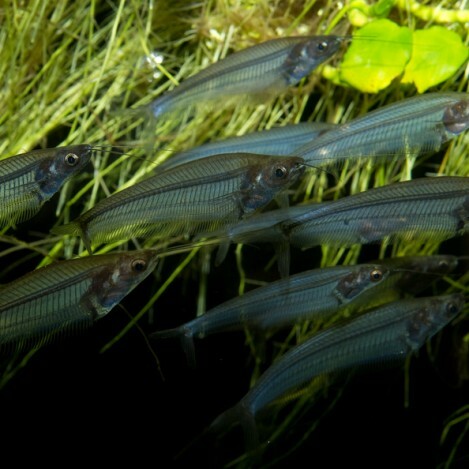 The ghost cat fish are a very sensitive fish so do require mature aquariums. They like the PH slightly acidic, so they can take lower PH levels down to 6.5. But they are fine with the PH in the 7 range. They can tolerate water temperatures of 77 °F, 22 °C. They can grow up to 8 cm fully grown. They are a lovely peaceful community fish. They get on well with small and medium size fish. They prefer to be in small groups and on there own they can be very shy and hide a lot. So small groups are best. They will eat anything you put in dry foods and also do require some live or frozen foods. As they are a see through fish at feeding time it can be interesting to see the food going in to there stomachs. They are a lovely different fish to have in the tank, if you can spot them that is. The Ghost cat fish will eat food from the surface and the bottom of the tank. We recommend feeding the Ghost cat fish once a day at the most. Good foods for the ghost cat fish are.